FLORIDA - The US Coast Guard has offloaded nearly two tons of cocaine, worth more than US$46 million, that was seized in the Caribbean Sea over a two-day period. 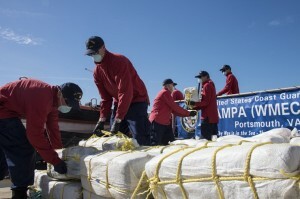 The 1,580 kilogrammes of cocaine, seized during Operation Unified Resolve and Operation Martillo, were offloaded last Friday in St Petersburg, Florida. Of the cocaine which officials say has a value of US$46,681,100 wholesale, 820 kilogrammes were indicted during a joint boarding conducted by the crew of the Coast Guard Cutter Joseph Napier and Coast Guard Cutter Heriberto Hernandez, two Sentinel-class cutters homeported in San Juan, Puerto Rico, on December 20 last year. The remainder was seized two days later by the Coast Guard’s Tactical Law Enforcement Team (TACLET) South deployed aboard HNLMS Van Speijk, a Royal Netherlands Navy ship, operating in the Caribbean. Operation Unified Resolve is a combined effort between the US Coast Guard and international partners in the Caribbean region to deter illicit activity and interdict vessels smuggling drugs and illegal migrants to the United States. Operation Martillo is Joint Interagency Task Force South (JIATF-S) led multi-national detection, monitoring and interdiction operation conducted by U.S. Navy, Coast Guard , and Customs and Border Protection vessels and aircraft working in cooperation with military and law enforcement agencies from various Central and South American nations, Canada, the United Kingdom and the Kingdom of the Netherlands.